The theory that global warming may be contributing to stronger hurricanes in the Atlantic over the past 30 years is bolstered by a new study led by a Florida State University researcher. The study will be published in the Sept. 4 edition of the journal Nature. 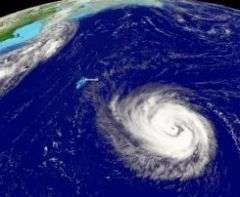 "Kerry Emanuel of the Massachusetts Institute of Technology first suggested the possible connection between global warming and increases in tropical cyclone intensity in a 2005 paper." No mention of the measurement methods which the data spans. For instance, satellites are te primary method of measuring hurrican activity with actual flights into the hurricane as secondary measurements (but important for wind speeds). It's not hard to imagine how much room for error there is in measuring hurricane activity, and how much variation in measurement practice there has been in the time span of this study, but they don't seem to be talking about that. Here's the point: If I take a position on something I want to investigate ( a bias if you will ) and the data I analyse is inhomgeneous and fraught with difficulty, it would be quite easy to project my bias on the data. Unfortunately there are quite few who are taking a critical eye toward this, and why should they? It doesn't pay to criticize the anthropogenic global warming crowd since they are playing politics. I think it's fascinating how many people rated MikeB's post highly. The vast majority of his post was a quote from the article they just read and a broken link. It doesn't take much to please people, I suppose. The link was working wnen I posted it. Try this one. I just checked the first link (you are correct it doesn't work)and am reposting it. Yes, it is indeed a sad commentary on the intellectual bent of those who are the most vocal. They would do well to heed Abraham Lincoln's adage that "It is better to remain silent, and be thought the fool, than speak and remove all doubt." A quotation that seems apropos relating to the "we can solve it" crowd. And here is one for Computer Climate Models. Looks like nothing changed in his views, he is still a cautious supporter of global warming as a reason for increased average energy of hurricanes in general and an increase in frequency of hurricanes in northern Atlantic. His position looks pretty solid. No need to quote dates, it shows google was involved. 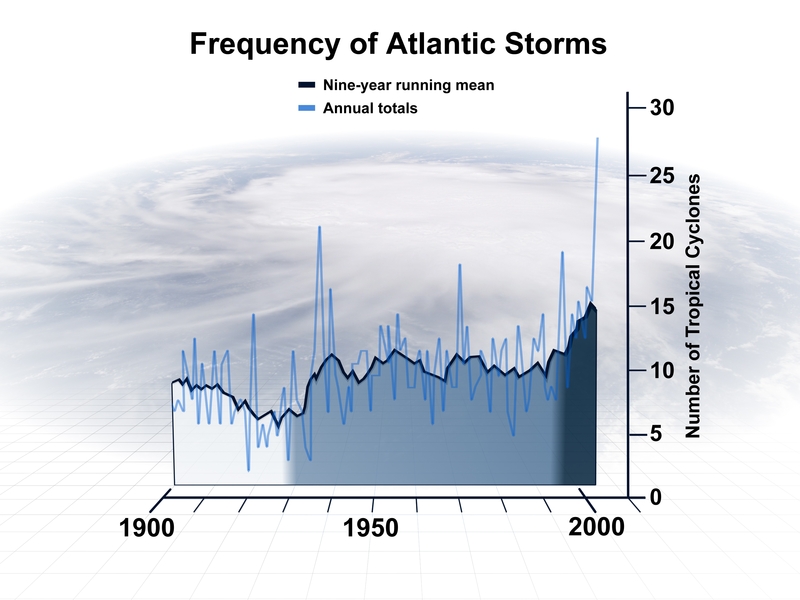 There is actually a marked decrease in frequency of hurricanes in the Atlantic. Typically we'd expect to see between 10 and 13 hurricane force storms in the season, lately we've been seeing around 8 or 9 that actually reach hurricane strength. That and I recall reading that monsoon activity was down in intensity and regularity. If both of these hold true then it's more a shift in atmospheric energy than an increase. "Frequency of Atlantic Hurricanes Doubled During Last Century"
Start backing your claims with links to relevant reports or data, your word alone is not enough. The one I cited is from 2007, national academy of science, yours is from 2002, if you have 2 conflicting results the newest one takes precedence. Besides those 5 years missing from your study seen the largest increase in frequency of hurricanes so perhaps it can explain the difference. 1) Your article is in regard to tropical storm activity. A tropical storm and a hurricane are rather different things. Effectively you're comparing a 15 year old to an adult. And yet you argue that this article is not about hurricanes? Haha that's a very convincing argument you made there. 2) The graph measures tropical cyclone activity. I know this is more a matter of semantics but Cyclones aren't formed in the atlantic, nor are they hurricanes, they're tornados. LOL, you claim that tropical cyclones are tornados? Tornados are a completely different thing formed only on LAND and tornados only cover a tiny area, while tropical cyclones can strech over significant portion of the planet! Also hurricanes ARE tropical cyclones, so tropical cyclones ARE formed in Atlantic. Seriously google the terms before you use them you wont make yourself look so foolish. Age of a paper does not make it more of less relevant, especially concerning past data availability. If the data on the 1900-1930 period was not in existance in 2002, where did it come from for the 2007 paper? It does make it more relevant when it concerns LAST CENTURY, last century is today-100 years, so its pretty damn obvious it depends on the date. 4) Back to the graph, your graph is guilty of "hockey sticking". That's when you take the actual disambiguated results and create a mean line that shows a trend. That trend is not accurate as it takes disambiguated data and attempts to modify the perception. What the hell are you talking about? What is "disambiguated data"? Your definition makes no sense whatsoever. It looks like your favorite way of proving your points is making up some random terms on the spot in hopes others will be scared by them. Haha, well it wont work here, either link to the definition or explain it properly. Let's face it, you have to try MUCH better then that! How did anyone including yourself do anyting to prove your point? Was your point "there is no increased intensity in hurricane activity"? If so the arguments you provided dont stand up to the generally accepted records wich show a significant increase. If they are wrong youll have to work harder to prove your point, claiming to have your point proven suggests you`re running on fumes.